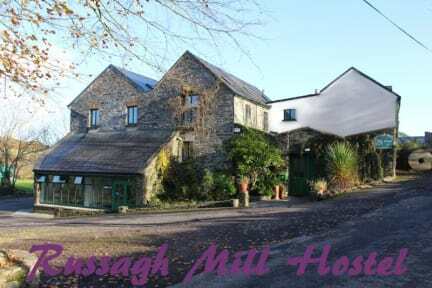 Russagh Mill Hostel, Skibbereen, Irlandia : Rezerwuj teraz! Russagh Mill Hostel is Failte Ireland approved accommodation on the Wild Atlantic Way. 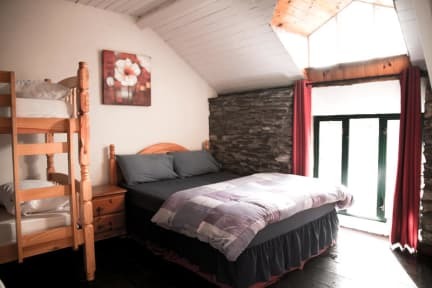 Stay in a beautiful 200 year old grain mill converted into a meeting hub for outdoor enthusiasts and backpackers in a quite rural setting just 1 1/2 km from the market town of Skibbereen in the heart of West Cork, Ireland. Ample safe parking is available on site for free. There is a large communal terrace with barbeque and sofas. We look forward to your visit! Also a wide range of activities are available for all ages through our adventure centre including archery, raft building, wall climbing and orienteering. Only 1 and a half km from Skibbereen on the Castletownsend road. We are just 4km from Tragumna beach. 7km from Europe's largest saltwater lake Lough Hyne. 6km from Reneen Woods (the fairy forest). 16km to Balydehob and 13km to Baltimore. Offering accommodation in shared dormitories or private double / family rooms (double bed and bunk bed). Catering for individuals, small and large groups. There are lots of comfortable common rooms with free Wifi & a large kitchen for self catering as well as a conference and games rooms. We loved the hostel because it was quiet and very clean. We liked the kitchen where we could make some dinner. The hostel was spacious and outside the town Skibbereen. A great place to relax and meet new people. The staff as very nice and welcoming, always had time for a chat with us. We would like to come back to this place, and we are going to do it again!! !